Good Afternoon all, it’s Liza, the Owner of The Wandering Path. 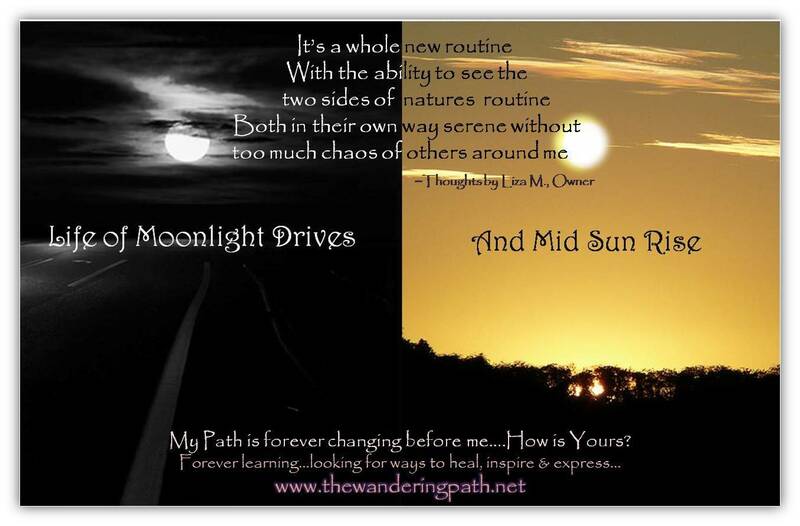 This past week has me on the next new routine…and the graphic I put together below is what it feels like so far…so many thoughts happen on that moonlight drive….and I gotta admit, the mostly “green light” drive factor is fantastic. The mid-day rise is the hardest to get used to as I am more of a night person so I don’t feel like doing my errands or other things until it is near sunset. Wish me luck as I get used to this new routine and hopefully soon the mid-day will become a welcomed time and not one where when I stare at the list of things to do and the “ugh it’s hot” factor feeling begins (and yes you guessed it… a face plant into the nearest pillow). BB, thanks for listening. –Liza M.
Good Evening all, it’s Liza, the Owner of The Wandering Path. I do apologize for the lack of blogs lately. I’ve taken on a full time job as well as continuing to do my business. I have been taking some of my own advice I give to others…making sure to take time to rest and relax while trying to juggle this new outside job and my passion. Facebook posts & shares are easier than me scripting (yes I write this in html code because I like fancy fonts & colors), so please follow me on there until I find the new balance with this routine. I hope you all are enjoying the summer and making sure to also take time to ensure you are keeping yourself both physically and mentally rested to be around others. BB and enjoy the rest of the evening! –Liza M.